Ok, here are some pic. Still working on how to pretty it up. I contacted Svet, and working with him to get an unlocked bios. I think i also figured out how to add to 40mmx7mm fan inside the case and using the USB power. The other power option would be to take out the 2.5" ssd and use the space and power from there, but to make up the storage shortfall, I would neet to upgrade to a 2TB Nvme. Not sure I want to drop about $500 on that, so hopefully I can get the USB power to work. Still working on exact details. Any ideas? We'll see how this goes. Jan Prochnica, Shark00n and Kevin@GenTechPC like this. Ok. I added some fans, using the USB port on the left side to power it. I bought a cheap L-shape usb cable and spliced a connector to it. I liked this cable because it is reversible, and little more low profile when plugged in. I installed two 40mmx7mm fans (6.5 cfm each), plus two 30mmx7mm (3.3 cfm each) blowing air in. The hardest part was finding a spot where the fans were not against a component, so that is why the fans are placed where they are. The electrical tape covering the area next to fan, is so I can force the air blown into the case up and over the CPU and GPU blocks, for a little extra air flow and cooling, while also cooling other component. This is not the final product. I think I will clean it up, by using a different type of tape instead of electrical, although it might be the best option because it is no conductive. I will also find a better way to mount the fans. Right now I am using the really strong double sided mounting tape, which is pretty strong, but not permanent. So with this configuration, I was able to get the GPU temp to top off at 81c and CPU topping off at 72c, wilthout LM. I have GPU overclocking set to +170 GPU clock and +220 Mem clock. I thought those were pretty good numbers. The negatives to all this is it does increase fan noise, loss of the USB port on the left side, and no way to turn off fans, without unplugging from USB port. However, all the modification are done to the bottom cover only, which I was able to get a used GT62, so nothing was touched on the motherboard. I did this, so that in case I had to return the machine for warranty, I can just pop the original bottom cover back on and ship it off. I included the pics for people to see. Please let me know what you think. Semmy, Jan Prochnica, Shark00n and 1 other person like this. I think you made that cable coming out the bottom as pretty as it could be; nice work! I'm really glad you're getting somewhere with this project. I just got my GP73 from HIDevolution and they did all their thermal mods to it. I'm topping out at 87° after gaming for a couple hours straight. I'm wondering if I could use a hole saw to get some nice clean cutouts where the fans are and install a filter mesh to get some extra airflow. HIDevolution offers their bottom plate mod on the higher end MSI models, but not on the one I got. Nice work from a true modder. How loud are those little fans? And why did you feel the need to put aditional fans in that area? Thanks for the support. I really appreciate it, coming from you guys. The fans are loud. About 1/4 the loudness of max fans. It's very noticeable by itself, but then again when gaming, I'll usually have head phones in or volume up, so it's not noticeable then. When not gaming, I can unplug the fans. I need to think of a way to mount the USB plug when not in use. Maybe magnetic tape or something. Anyways, I added the extra fans because when I cut the holes, the center of the mobo was no longer getting air flow and started to get noticeably hot. By adding the fans, I was getting air flow again. I decided to seal of the bottom area by the fans to add extra air flow by creating a wind tunnel, which definitely helped. This little project was a lot of fun. It's a shame is almost complete. Not sure what I can do next. 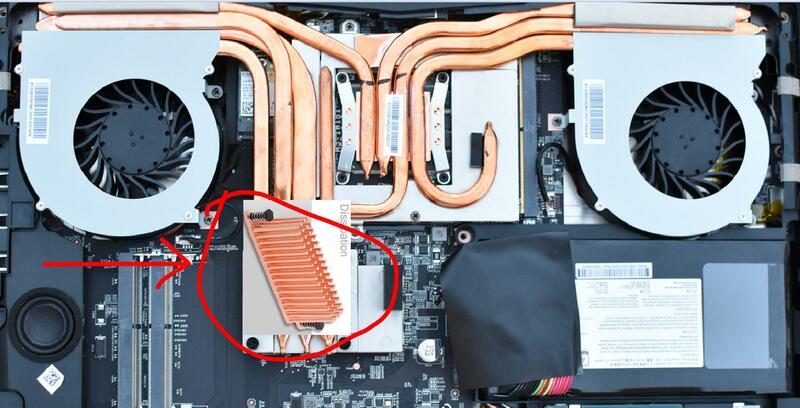 Liquid cooling maybe? That is the problem, with all respect to HIDEvolution, that cover mod with increase the temps of ssds for example. Another quick update. I bought an after market GT62VR Fan from amazon (link below), because in the comments it said that this fan was able to get up to 5000 RPM. I only bought one for now to test, and I installed it on the GPU side. I was able to get the GPU temp to top off at 79c, along with the other case mods, but man is it loud. It sounds like a get engine at times. Now I see why MSI went with the fans it did. 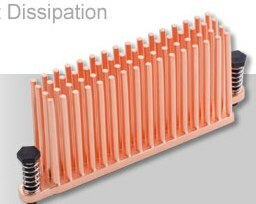 I think I will buy one for the CPU side as well. I was thinking about applying LM at some point to see if I can get it even lower. We'll see if i can get some courage for that endeavor. You can try to take such a radiator. And do something like the photo. Then your fans will take heat from it. Unless of course there is enough space under the lid for him.